Offering evidence-based techniques with a solid scientific foundation, Cooperative Veterinary Care puts the focus on preventing and reversing fear and stress in the veterinary setting through preparation, planning, and most importantly training. This comprehensive resource provides guidelines for patient-centered care from the moment an appointment is scheduled through the time of patient discharge. Spanning topics including sensation and perception, hospital organization and protocols, equipment and tools, learning theory and excellent training techniques, Cooperative Veterinary Care takes the team through procedures step-by-step using practical and proven examples. From physical examinations to venipuncture and radiographs to vaccinations and nail care, this manual prepares the team to work with patients the compassionate way every day. 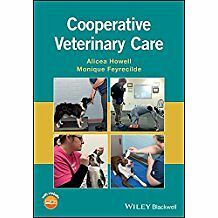 This manual brings these highly effective techniques to the companion animal healthcare team, written in accessible language and filled with proven approaches based on the authors' combined 35+ years of hands-on veterinary medical experience.